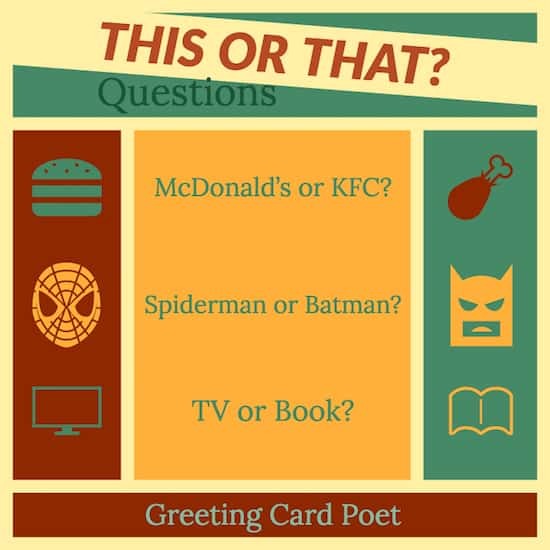 This collection of this or that questions, although seemingly very easy, may give you pause. Questions like these make you think – sometimes harder than you’d like. Tell yourself: that’s a good thing! 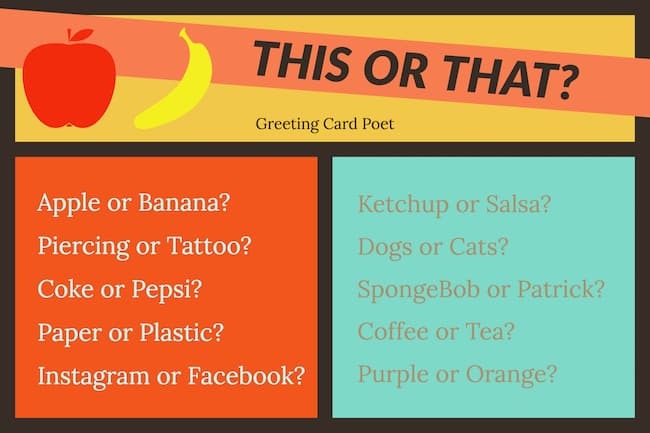 We’ve put together this list of either or questions for you to play at home, in the car or anywhere you find the time. So, have a go. And remember, there’s no “ties” or I like both equally, or I don’t like either. Make your selection and stick to it. It’s the only way to play. It’s more fun when you explain your answer, and bonus points for anyone who adds a little humor to their responses. Have some fun with these. French fries or sweet potato fries? Phone call or text message? Scrambled eggs or sunny side up? New Year’s Eve or Halloween? Jay Z or Kanye West? Sky diving or bungee jumping? Click on graphic above to take you to our Hard Riddles page. Bring your “A” game with you. New York City or Paris? Backpacking around Europe or South East Asia? Scuba diving or hiking up a mountain? Working alone or in a team? Machu Picchu or Taj Mahal? Great Wall of China or the Roman Colosseum? International vacation or new phone? Hot coffee or iced coffee? More money or free time? Could only live with photos and camera or music? Cooking at home or dining at restaurant? Backpacking at hostels for 3 weeks or staying at a resort for a week? Lifetime of free clothing or free flights? Music concert or comedy show? You might like our brainteasers page. Click on graphic above to go there. Making snowmen or having a snowball fight? Be fluent in Mandarin or French? Going on a spaceship or submarine? American Idol or America’s Got Talent? Going out or staying in for the night? 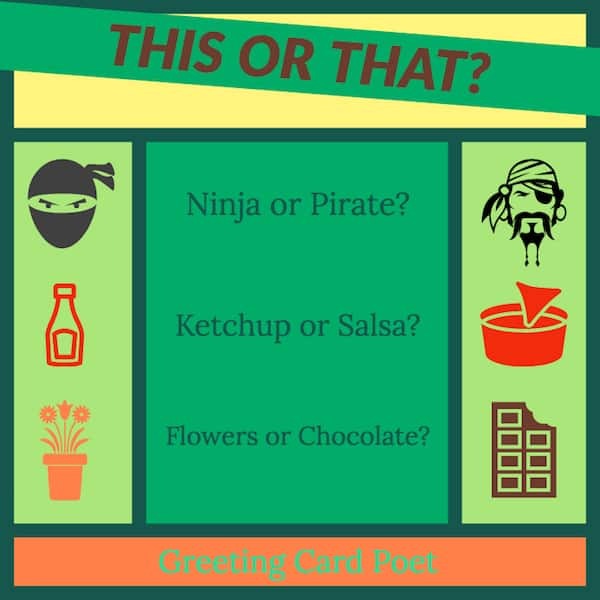 You might also like the Truth or Dare Game questions. Reality TV shows or gameshows? Surprise party or costume party? When Brenna is not writing game questions, she may be writing test questions for her class. Brenna works full-time as a high school English teacher in Trang, Thailand. You’re on This or That Questions page.